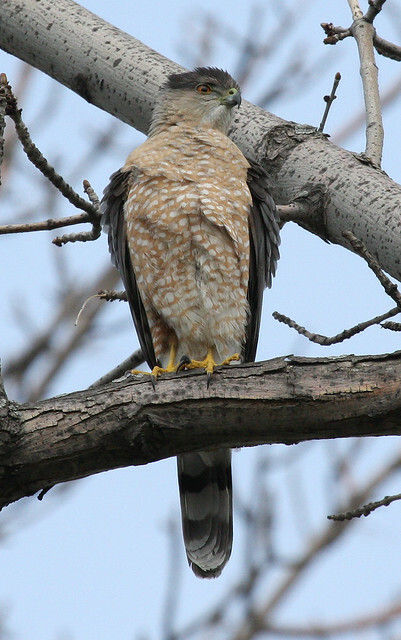 The Coopers hawk is one of the three accipiter species of hawk in North America, and have become a common urban hawk in a number of areas. 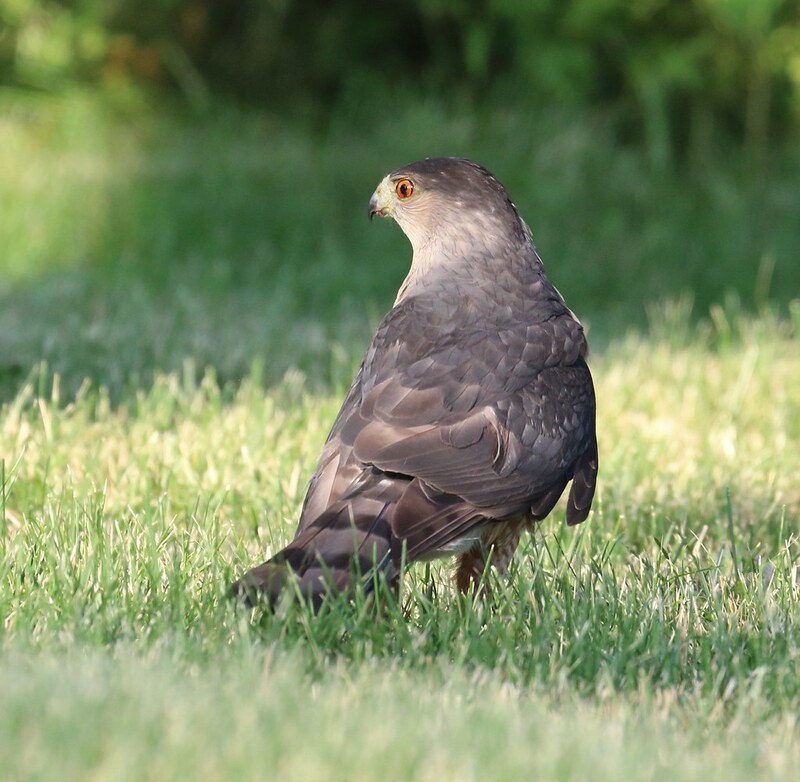 Over the past couple of weeks my local Silverthorn Park Coopers have been continuing activity, up until today I had observed vocalizations and interactions early in the morning several times, including mating a couple of times, but without any obvious stick work at all within the park. However this morning I saw the male flying several sticks up to last year's nest, followed by mating with the female. So this is the first definite indication of activity that suggests they intend to reuse that nest. There are other trees which might be possibilities for a nest, but not very many others left, so this is the most likely option. 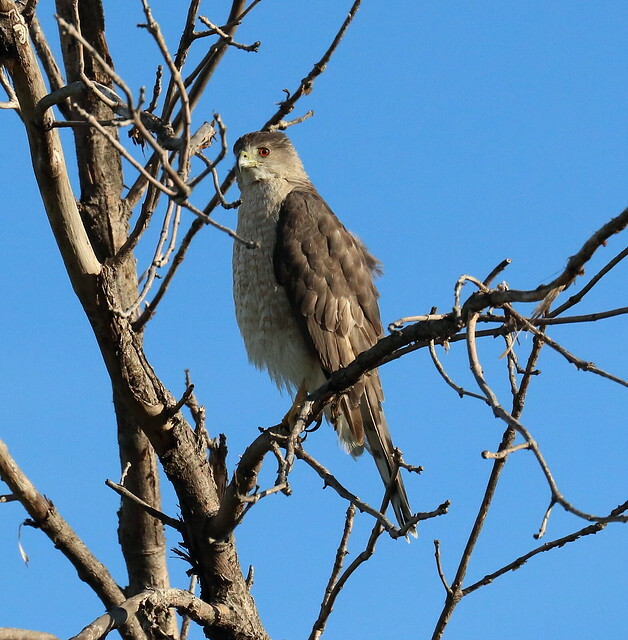 As of Mar 18, the High Park Coopers were also in the midst of nest building and courtship activity - this time they seemed to be centered again on last year's nest, although there is a small nest structure in a nearby deciduous tree. But the female flew up into last year's nest bowl several times, so they also seem to be likely moving towards using last year's nest. 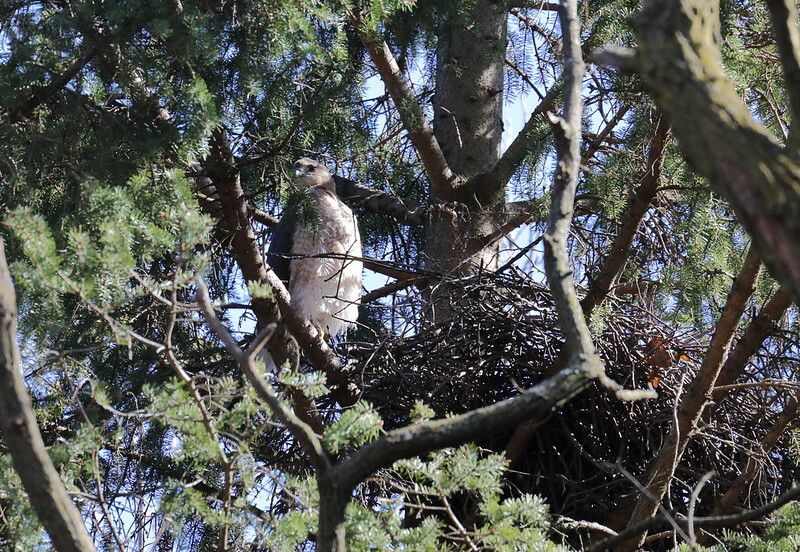 The last two weeks I have visited (Apr 1, Apr 8) I have seen the High Park Coopers showing early morning activity with some signs of nest work both in last year's nest tree, and the older one from the year before. Apr 1 - both adults were in the vicinity of last year's nest, with mating, the female seemed to fly up into the nest on a couple of occasions, with possibly some sticks flown in. However subsequent to this, both adults ended up wandering up closer to the old nest area. The female actually seemed to fly rather aggressively at a squirrel which was in an adjacent tree which was surprising as they don't seem to notice them most of the time. Apr 8 - this morning (~6:45am) I found both adults nearby the old nest area, with definite work being done on it. The female several times flew up into the nest bowl and made quite loud kek vocalizations on a couple of occasions. However the male remained roosting nearby and didn't bring any sticks to this nest that I noticed. However about 10 minutes later the male did start flying around to different tree branches and twisting them (this is usually a sign they are trying to find one they can successfully break off), when he finally did so he flew off in the opposite direction towards last year's tree. 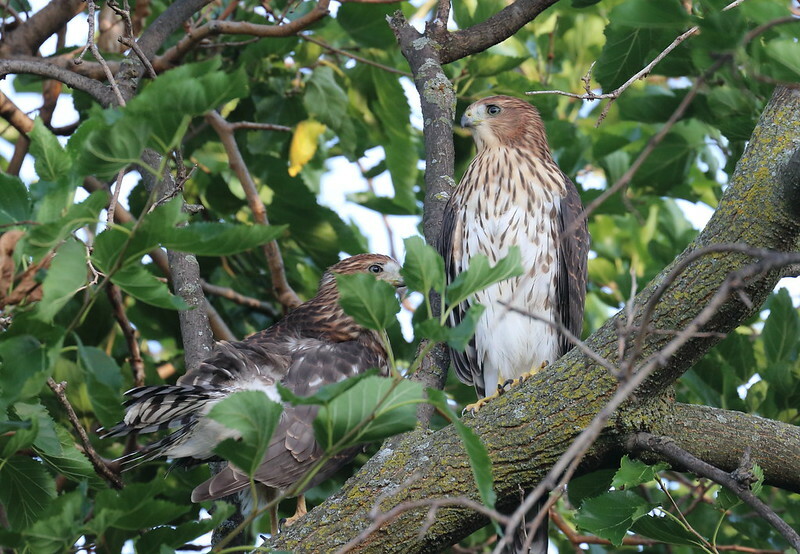 Both were briefly roosting together near the tree when I located them again, but did not mate. 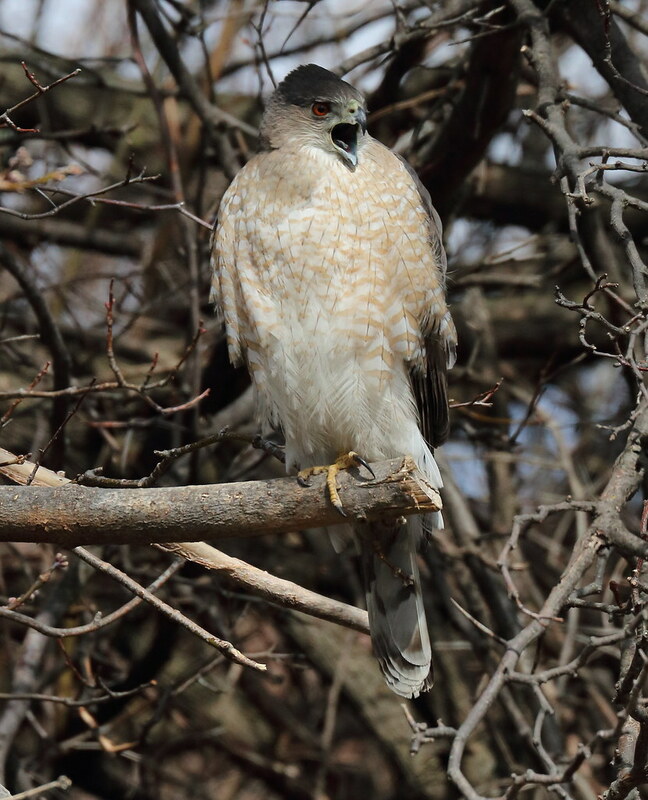 But the female shortly returned to an area closer to the older tree and was making vocalizations again. This seems to give the impression that the female is set on using the older nest tree, but the male is perhaps still trying to present last year's tree as an acceptable option. However the female makes the decision on which nest location to use, so based on this it seems more likely they may switch back to the older nest. In my territory, both adults have been present in the last couple of mornings, and the last two days (Apr 7, Apr 8) I have noticed the female still present in the park much later in the morning (around noon both times), this is generally an indication that she is getting closer to egg laying, she will tend to spend more time in the nest area each day, and testing out the bowl prior to the first egg being laid. However based on last year it should still be a couple of weeks before the first egg. Apr 9 - I was quite surprised to see my local female roosting in the nest tree just close to the bowl late in the afternoon on Monday, around 4:30pm when I was going out. Then it was evident that the male was there too, as he left the tree and flew over my head off to the SW as I was coming around to take a look. It's conceivable he was there having made a recent food delivery, the female presence is interesting because increasing presence in and around the nest tree over later and later periods in the day is something I take as an indication that egg laying is approaching. I was a bit surprised to see here there this late in the day this early in April. There was also a TOC meeting at High Park with a walk through part of the park prior, during this both High Park adults were spotted close to the older nest spot, just across the path, the male appeared to have just delivered a food item that the female had in her talons and was flying to a perch with. Apr 10 - in the morning I sighted both of my adults roosting side by side in a branch a little ways away from the nest tree. I did not see food but normally the male is around after he's provided some. Apr 17 - after two days of that awful ice and sleet filled weather, I was able to confirm that the nest still looks in good shape and I spotted the female roosting in one of her nearby spots this morning. There's still a lot of ice on the ground which makes it hard to walk around in the park. Apr 19 - early in the morning around 8am I found that the female was up in the nest bowl, not sitting flat, but somewhat crouched in the bowl, she seemed to be quite intent on staying there quite still. I was able to observe her for a few minutes and also found her again in the nest late in the day around 6pm. This is usually another sign of impending egg laying, as she'll start to spend periods in and around the bowl in the days prior to laying. I don't believe there was any sign she has done so though. Apr 20 - today I checked the nest tree a couple of times in the morning and the early evening around 6:30pm, but didn't find her in the nest on either occasion. In the latter case I was able to see her roosting in one of her usual spots across from the nest. Apr 22 - I visited the High Park territory and was not able to discern any activity around the older nest, contrary to what I was expecting, but there was some extremely agitated chickadee calls close to last year's nest, and it wasn't long before the female did fly in from somewhere nearby into last year's nest. She flew back out a couple of times, but then ended up standing in the nest bowl and was there for at least a half hour, which seems a pretty strong indication that she's back to intending to use that nest. I did also manage to find the male a bit after that nearby, he had a very large crop, so I wouldn't be surprised given how agitated the chickadees were, that he might have caught one of them. Apr 29 - I visited the nest area again for a while but didn't succeed to definitively spot the female in the nest or a sign of activity there. Once again I did see the male roosting nearby - if she's sitting yet it will take further checks to spot her. I am putting down Apr 26 as the likely date for start of incubation for my territory - I've been seeing the female consistently on the nest in sitting position since then. For the past several days now, back to May 27-28, I've been keeping a close watch out for any definitive evidence of hatching (normally food being brought back to the nest and clear attempts to feed are the best indicators), without catching any yet. 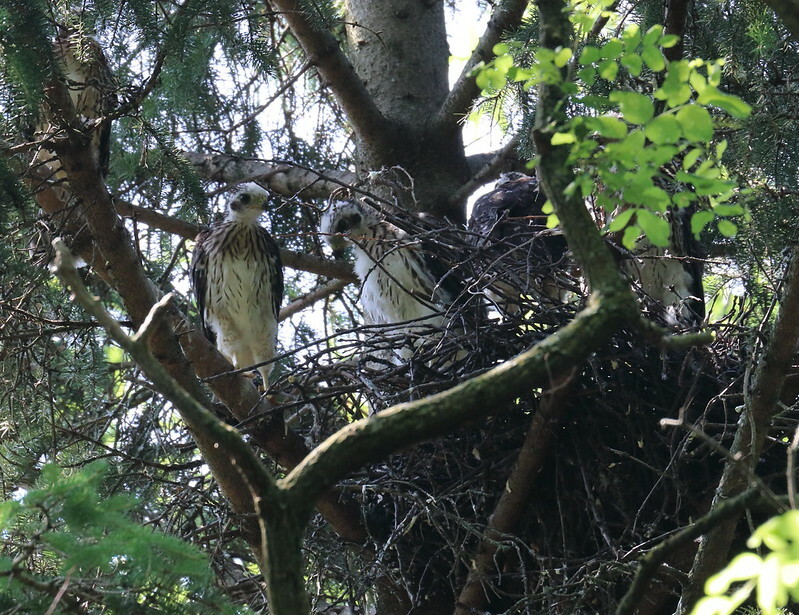 From about May 27 I have been seeing the common indicators of the female seeming to sit somewhat higher in the nest, this can happen somewhat in advance of any hatching, but seems to typically start a handful of days before. 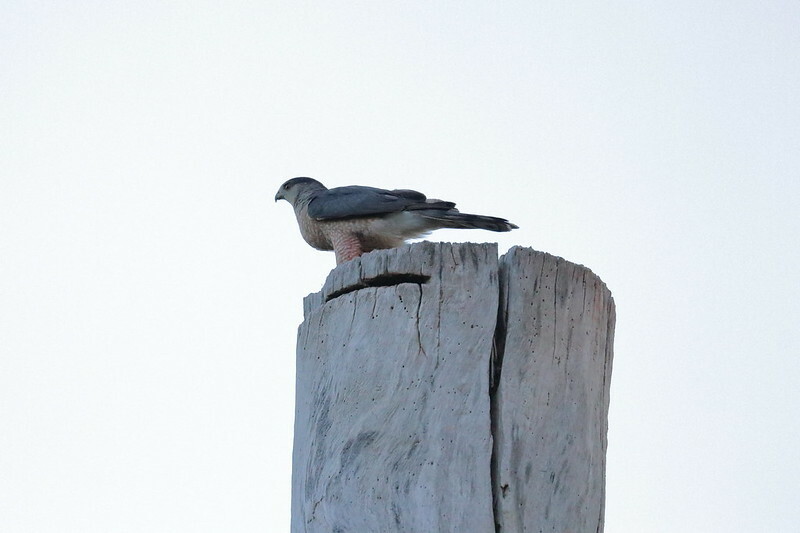 I have seen at least two different occasions on May 29/May 30 when I did catch the male in the area, either present when I went out or making announcement call. May 29 occasion he did appear to have some food which he continued to pull at and perhaps partially eat for about 7-8min on his own. 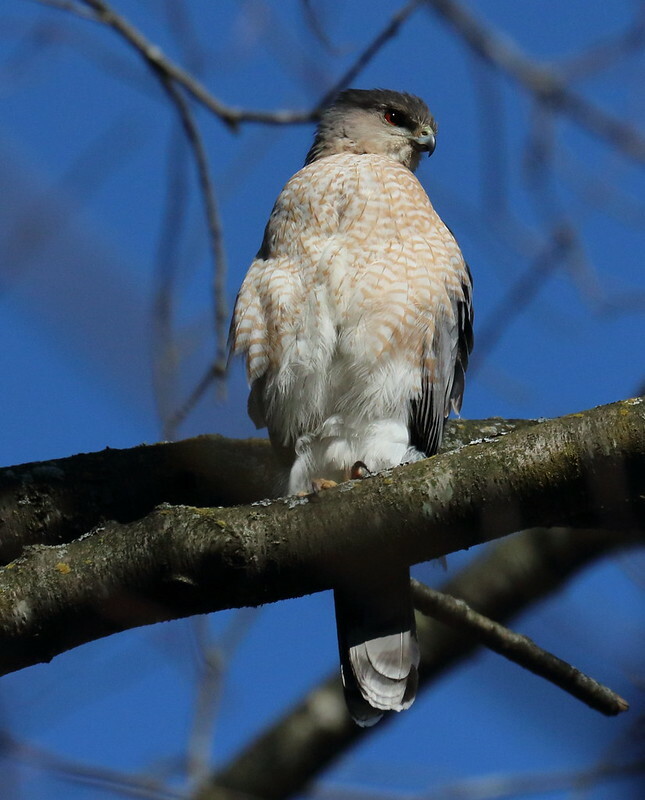 The female finally flew over and displaced him off his perch, but it was hard to tell whether any food was transferred to the female, they both ended up moving further away behind some of the intervening trees. When the female eventually returned to the nest I didn't see any clear sign she was doing any feeding. Yesterday (May 31) I spotted the male on one of his typical perches nearby the nest, the female did come over but flew into branches above him and a tree over, and there was no food exchange (although there may have been earlier since male seemed to have a visible crop and female may have as well). A bit oddly the female flew back and forth to the nest a couple of times grabbing a couple of very tiny twigs and stuck those in the nest. 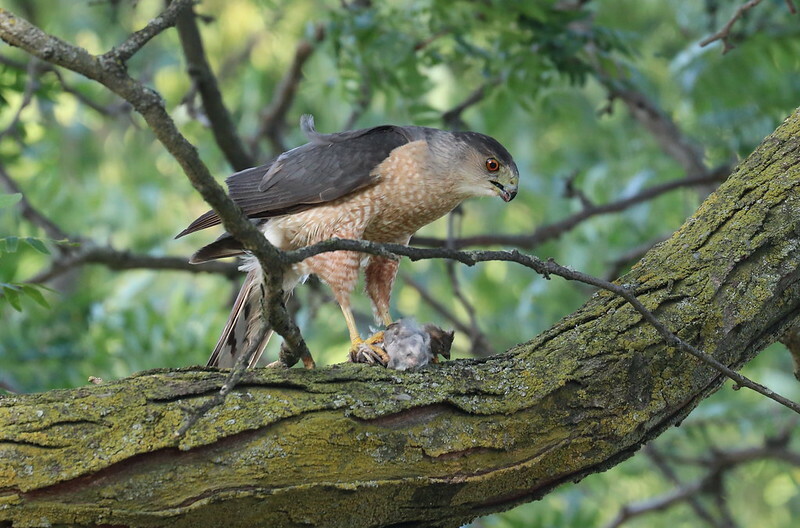 June 2-3, on both days I did catch either arrivals by the male which clearly included food, or went out when both adults were present, with the male attending the nest and the female with food nearby that must have been recently delivered. On each of these occasions though I failed to see any of the food brought to the nest, and the female appeared to finish consuming the food before later returning to the nest and displacing the male. 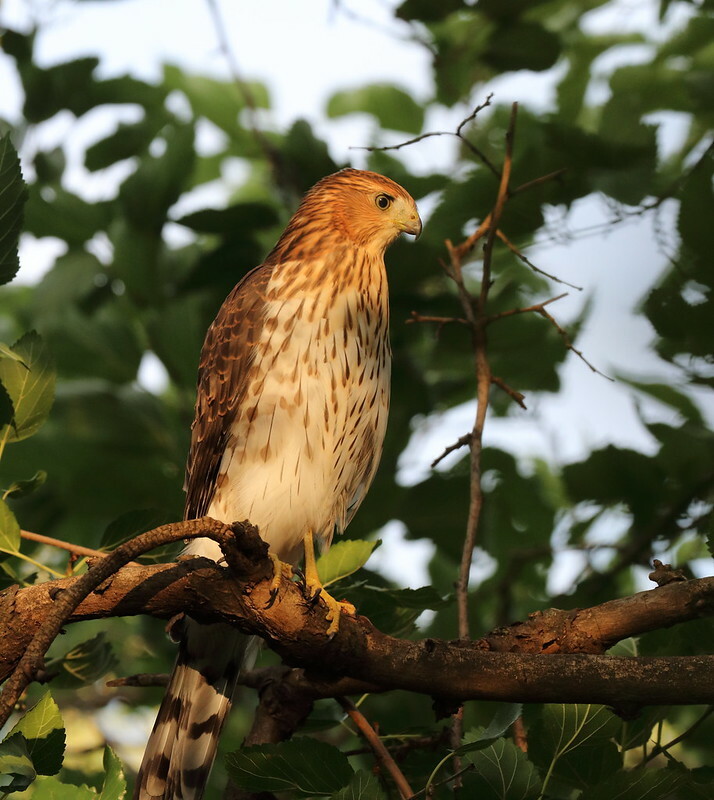 June 4 - during early evening, I was able to hear the male making an announcement call indicative of an arrival, and upon walking over to check their usual nearby branches for exchange, the female had yet another delivery. This is the first time I did see a clear retrieval of the food and the female carrying it to the nest, with definite indicators of her standing on the rim and pulling pieces off and offering them into the bowl. As typical very early after a hatch, it was not possible to make out any chicks from the ground, but this should be a reliable indicator that there has been at least one hatch. June 9 - in the early evening I was able to catch a feeding in progress and for the first time I was able to just barely see some white moving just in the gaps between the sticks at the edge, of a chick in primary down. It was impossible to tell however, whether there was more than one. June 10 - again an early evening food delivery resulted in a feeding, and from the grass side I could see a little better this time some movement of a hawklet during the feeding. I then walked around to the sidewalk and looked from that side, and I was able to get a much clearer view of at least one head in the nest. Again though it was tough to tell how many might be in there, a head kept bobbing up and down but it was never possible to see more than one at any given time. 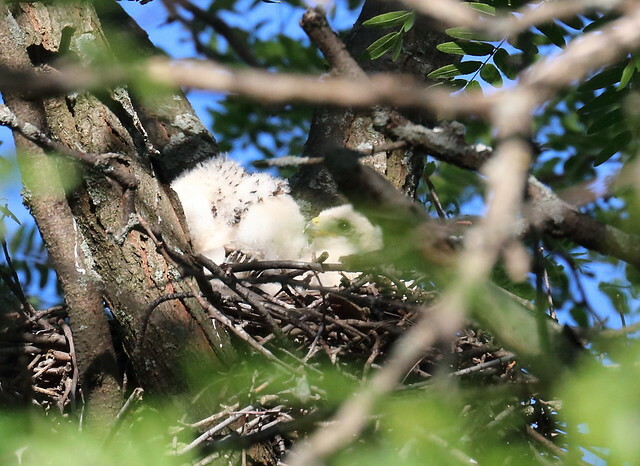 I was also able to confirm at least one hatching at the High Park nest, June 9 I spent about an hour and a half waiting near the nest area hoping for a food delivery which would give an indicator, without luck. However today when I went to the nest area mid-morning when I arrived the female was standing on the nest edge and a feeding was in progress. It was definitely not possible to make out any hawklets in the nest given the nest is so high from the ground, but the female was pulling pieces of food and offering them into the bowl. 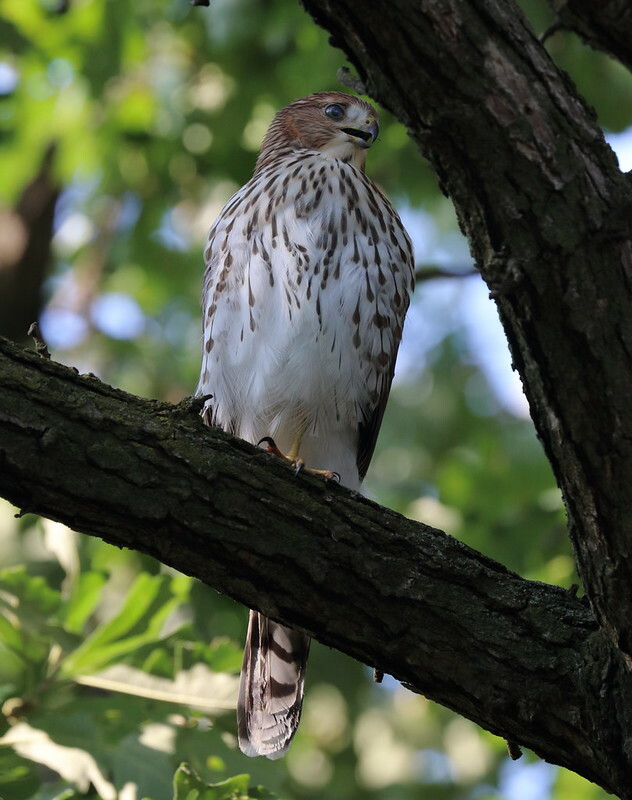 June 11: I observed the High Park female again standing as well as brooding in the nest, but otherwise hawklets are still not visible from the ground. 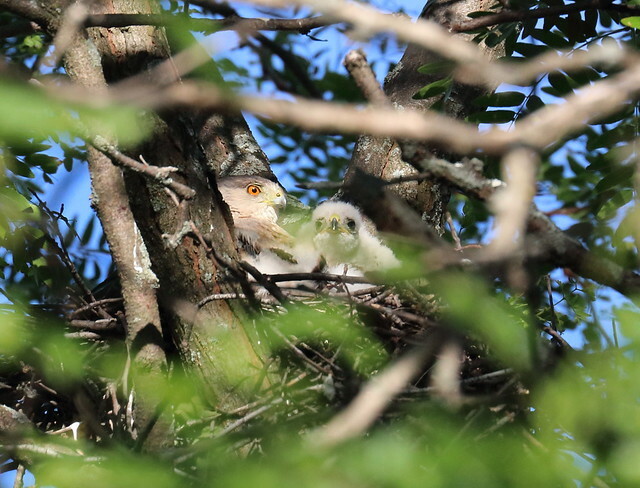 June 12: I was able to observe from the ground another feeding in which there was a clearer look at what was nearly certain to be two separate heads in the nest, although in binoculars there wasn't quite a 100% clear view of two heads at a time. 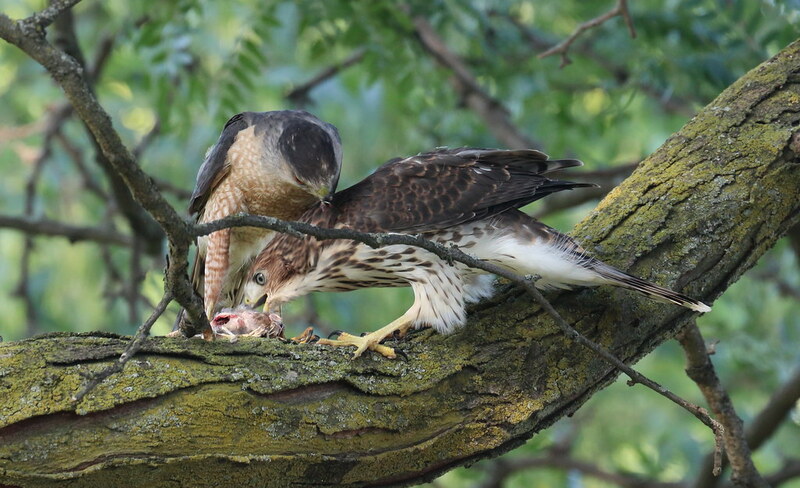 June 14: I recorded a morning feeding in which there was finally an unambiguous view of two hawklets. 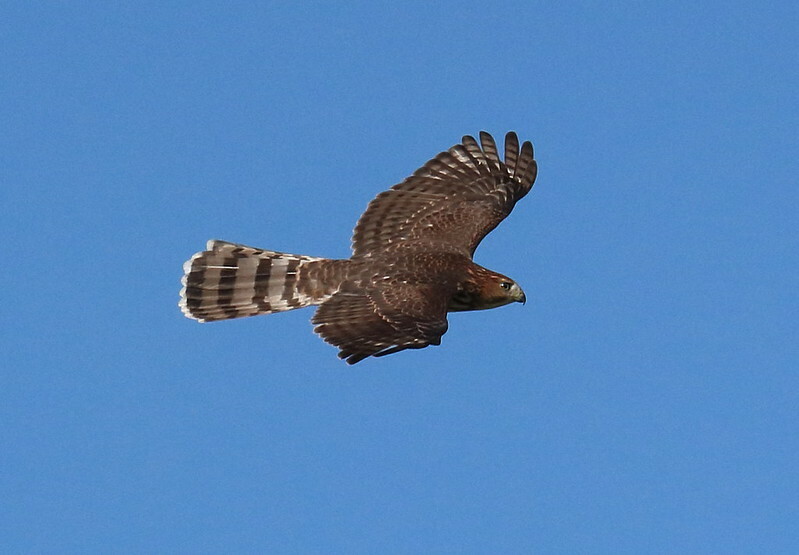 I could not see any clear indication of a third hawklet in the footage, but the hawklets were not sitting up high enough to tell for sure whether there could be more than two or not. 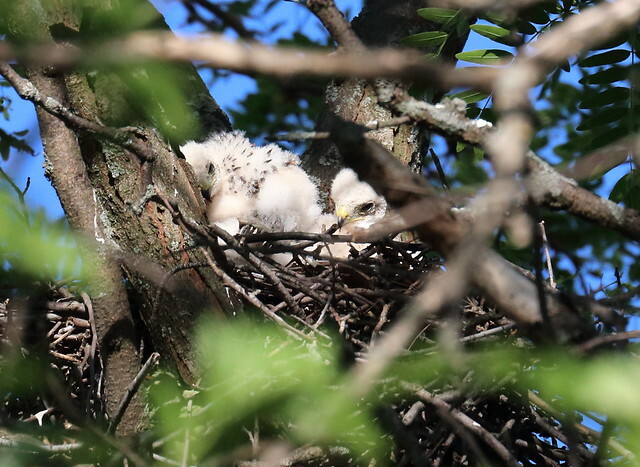 The hawklets still appear to be in full white primary down, without any significant feather development yet. 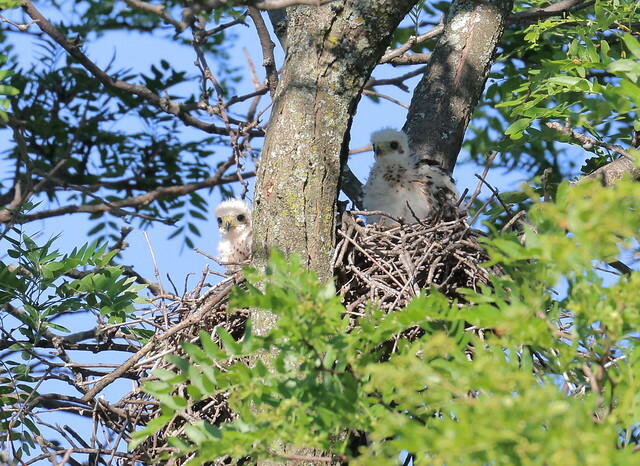 June 16: This afternoon I again saw two hawklets during a feeding, this time both individuals were sitting up noticeably higher and were more visible, although not standing yet at this point. But short stretches of the legs and accompanying opening of the wings were visible. Development of the hawklets has been continuing steadily, and on repeated days during multiple checks to the nest I've caught two or three feedings in a day, which suggests again that these hawklets are being particularly well fed. In previous years it's seemed to have been more infrequent to actually catch a feeding. June 22 - I did not catch a feeding on this occasion, but again the continuing pin feather development on the visible hawklets can be seen. 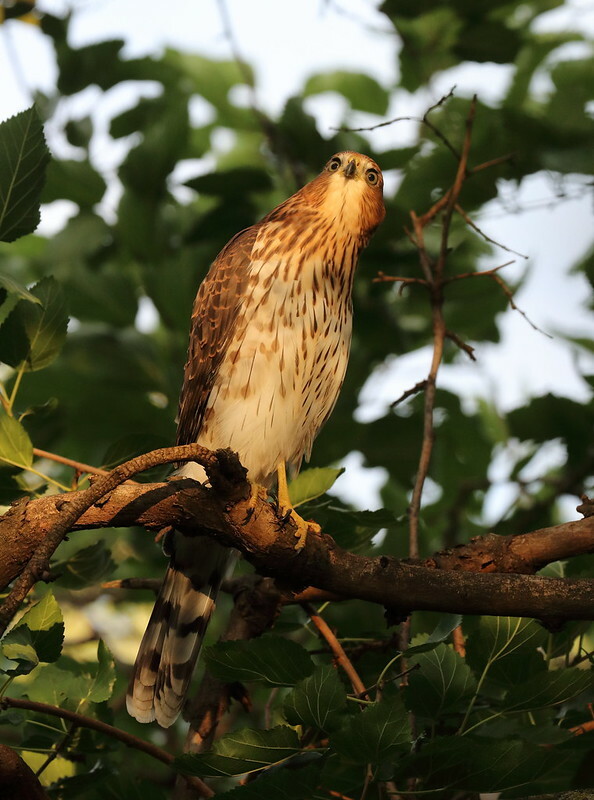 June 23: I also observed a hawklet standing up in the High Park nest, it was difficult to get views for long because of rainy weather, but it confirms there are certainly hawklets in the nest. The development looked similar, with the bird still fully in white down with some indications of feather development, perhaps a bit older since it seemed stronger on its legs and able to stand more easily. 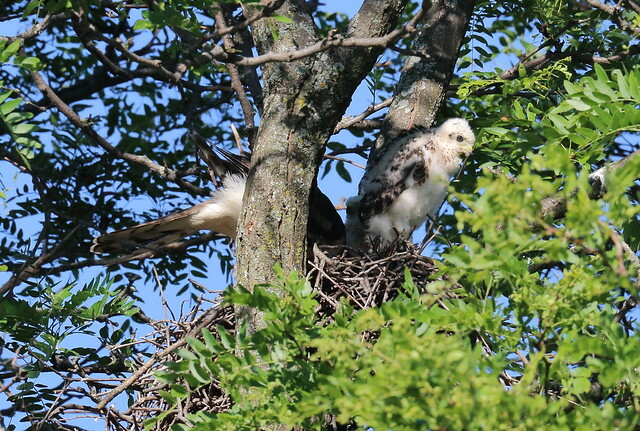 June 25: I was able to catch another good feeding, with both hawklets will visible in the nest, both have definitely lost significant amounts of their down on the body and full feathering is coming in quickly. 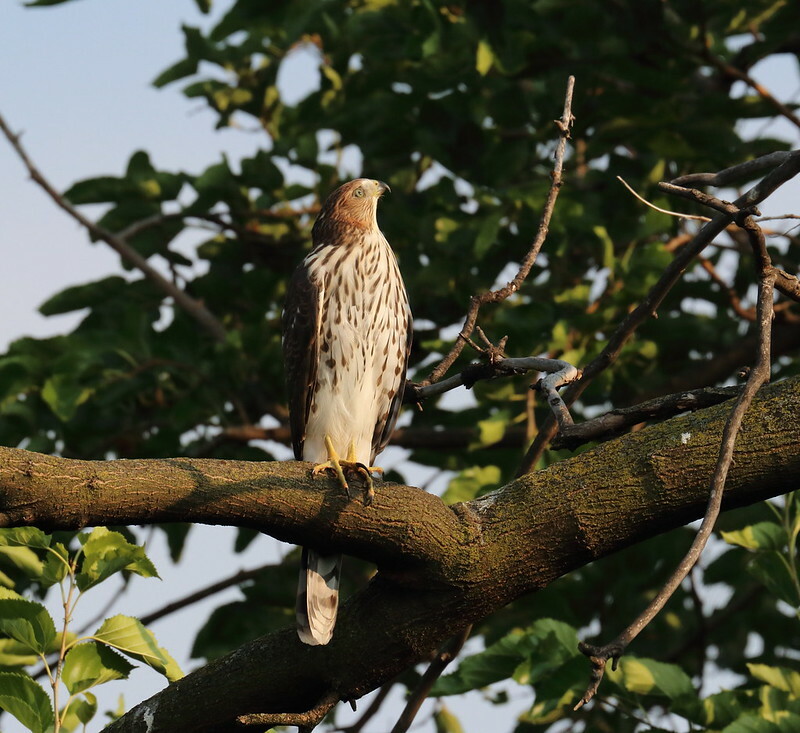 June 30: Lots of very exciting observations from High Park - I visited the nest in the morning and was very quickly rewarded with a sight of several hawklets in the nest. About 20 min after I arrived I was fortunate enough to catch a food delivery by the female which was a good opportunity to try to confirm numbers in the nest. Video footage definitely confirmed 5 hawklets, which is interesting, since it is larger than the previous two years (4 each). I am happy I caught this footage when I did, as the footage also shows they've become very active and are really starting to branch. Very likely in no more than a few days it could become hard to see or document them all together. July 2: In my own territory, I was also able in the morning to confirm both hawklets branched above the nest bowl, fairly close, but definitely with limited coordination and balance at this point in relatively high winds. 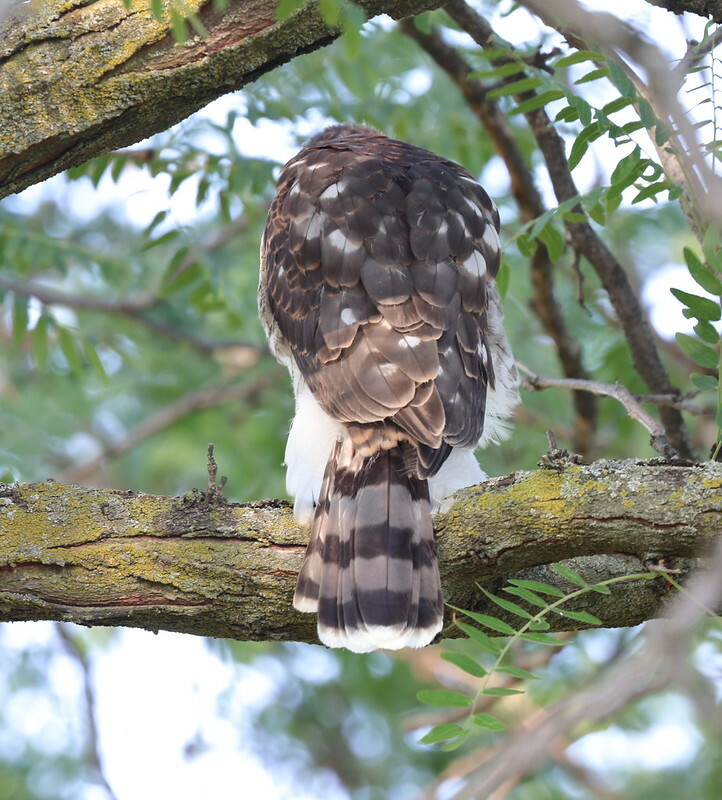 Later in the day I was again able to observe hawklets branched on the nest tree. 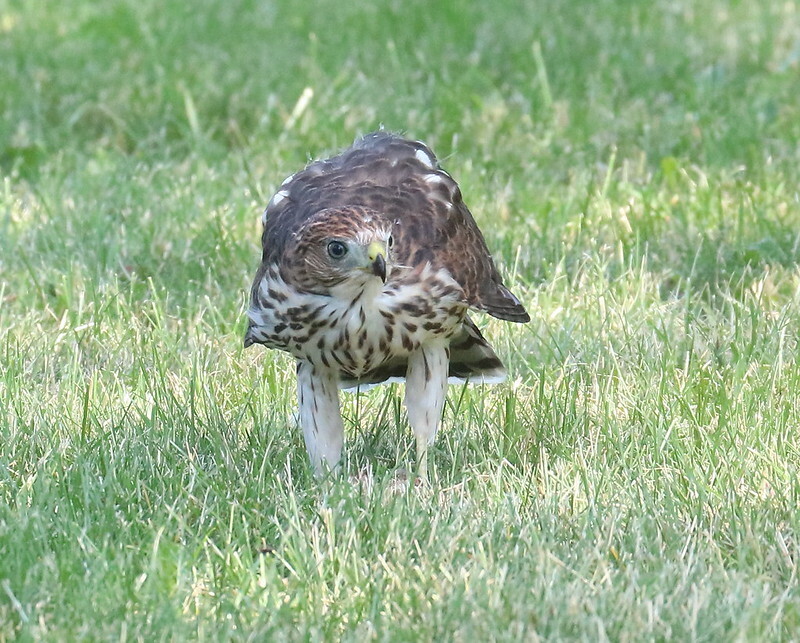 July 3: This morning, in my territory I checked the nest attempting to find the hawklets, and happened to catch the female coming in from the NE direction across the edge of the park, carrying prey that appeared to be likely a small deplumed bird. She did not land in the nest or do a feeding however, she just did a drop of the food into the nest and did a touch and go landing and flew back out. 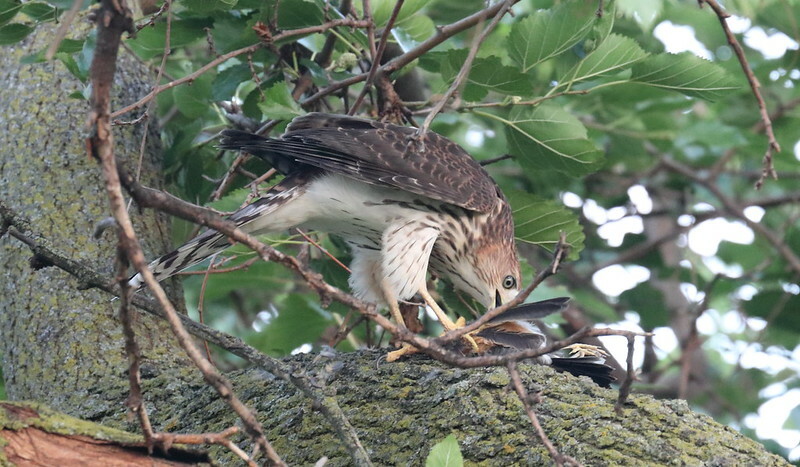 By the time I walked around to the other side of the tree I was able to spot one of the hawklets in the nest and starting to self-feed on the food delivery. 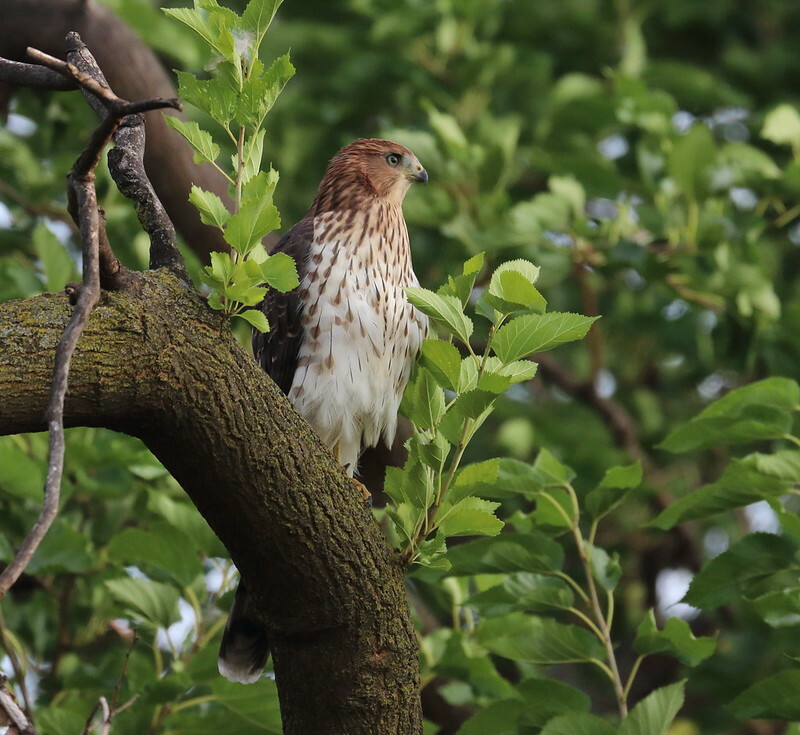 After about 30 seconds I was able to spot the other hawklet branched quite a bit higher in the tree, and starting to move downwards to get back to the nest, presumably in hopes of acquiring some of the food as well. However at this point their ability to navigate among the branches and balance is still very unsteady. 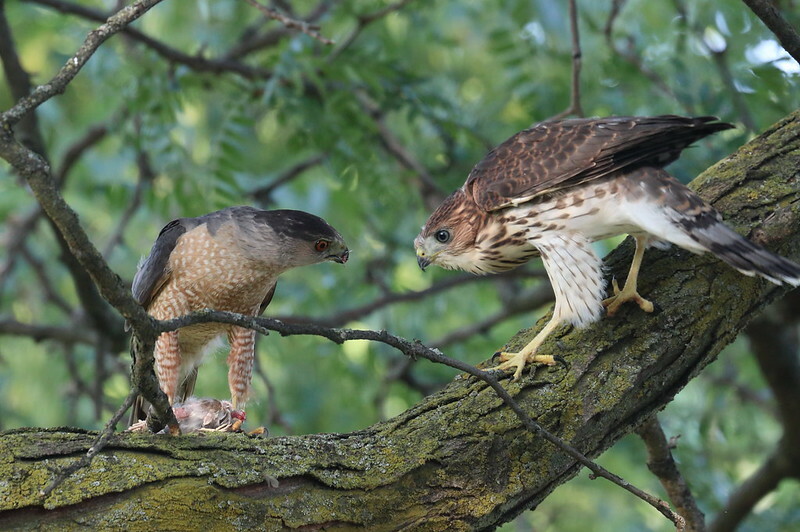 I was surprised however that neither hawklet made any whistling vocalizations either while the female was doing the food drop or after she left and the one in the nest started feeding. That's pretty unusual - normally once they've started branching any sign of food from an adult results in a lot of loud whistling vocalizations. This food drop was one of the quietest I can recall. This evening both hawklets were again together near the nest bowl, but outside it again. 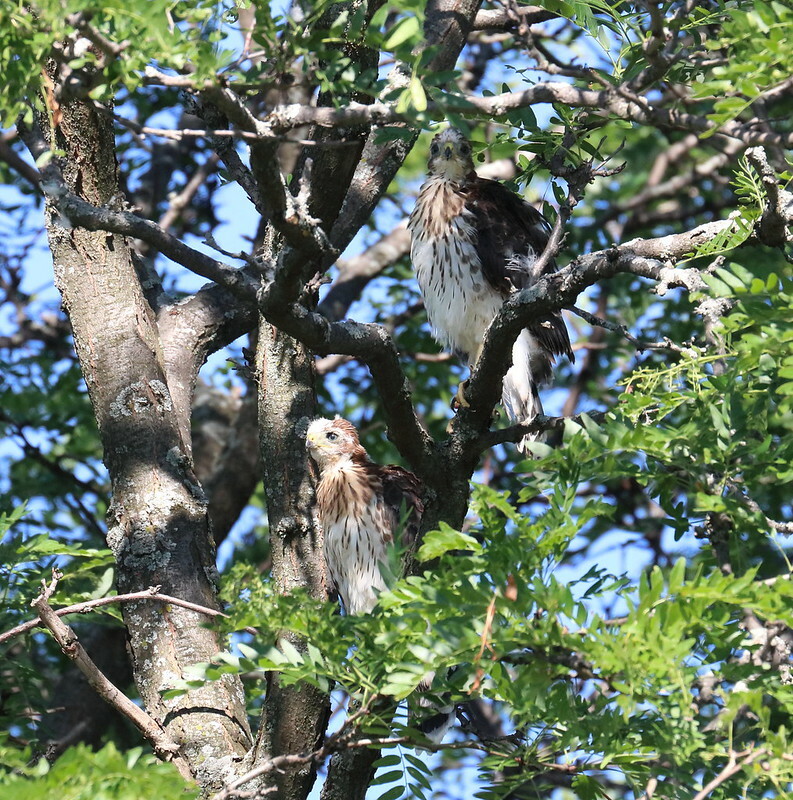 I have not yet seen either of the hawklets fully off the nest tree. 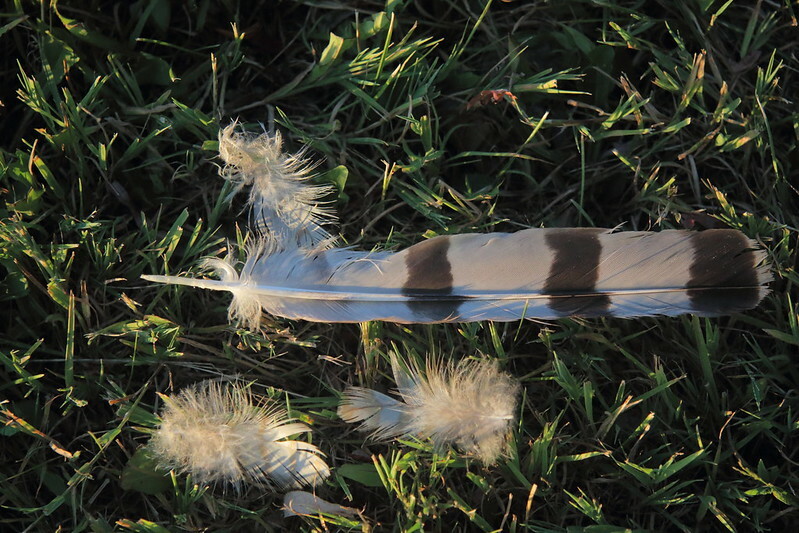 It is always an interesting find to come across molted feathers, it is likely the adult female that is in molt at this point, and I commonly find both flight and contour feathers on the ground during this post fledging period. I have a fair suspicion that both of these fledglings are male, but it is difficult to be sure. I was also able to get some footage of one of the fledglings. Over the past couple of weeks, especially for a few days after July 4, I have been having the puzzling experience of having a lot of trouble spotting the fledglings anywhere around the nest area, although I have to assume they are nearby, and with the removal of a lot of dead trees which provide snags/open perches, it is a lot harder to be able to see all the possible roosting spots from the publicly accessible spots in the park. The low bushes and foliage around the fences around the west edge of the park are substantially more grown and thicker than they have been in the past, which makes even approaching the fence and looking around the other side of the ring of trees and bushes very difficult, except in a couple of places. These fledglings at times seem to also be quieter than I have ever experienced in the past, even in certain circumstances when an adult is around, which typically prompts very strong whistling calls. 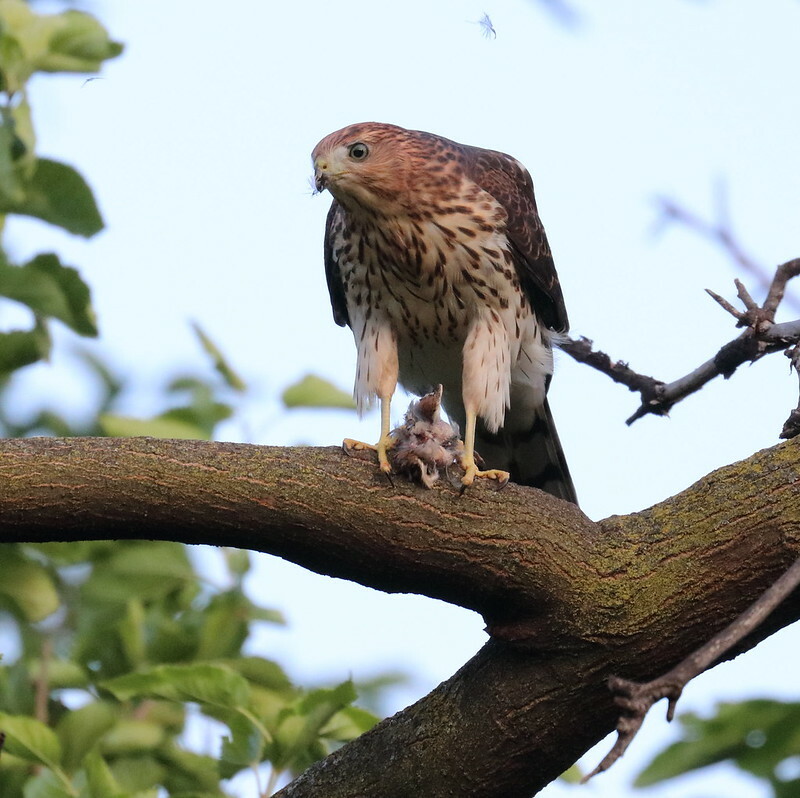 July 7 - in early evening I spotted the male arriving with food, and interestingly it did not seem to get any obvious reaction wherever the fledglings were, it flew to the high stump but didn't prompt any reaction. The male seemed to fly back and forth several times from the stump to the nest tree, presumably waiting for a fledgling to claim the food, but on this occasion I never saw whether this happened. 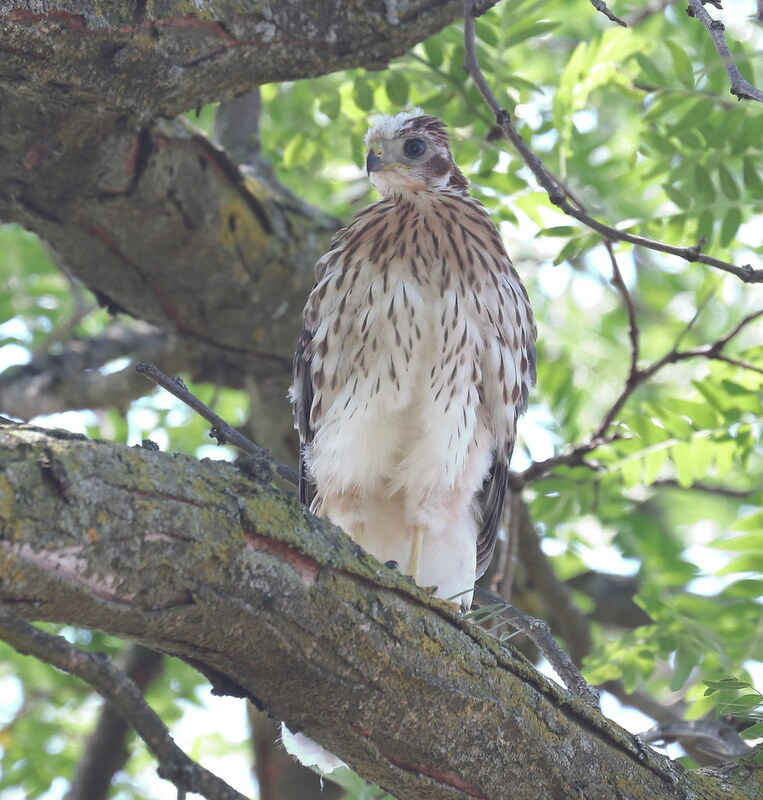 July 10 - I was able to find both fledglings on one of the trees very close to the nest tree, one with food and of course the other very interested. Interestingly, shortly after I found both on the branch, the one on the left became excited and started whistling, and the other that was feeding looked up as well. 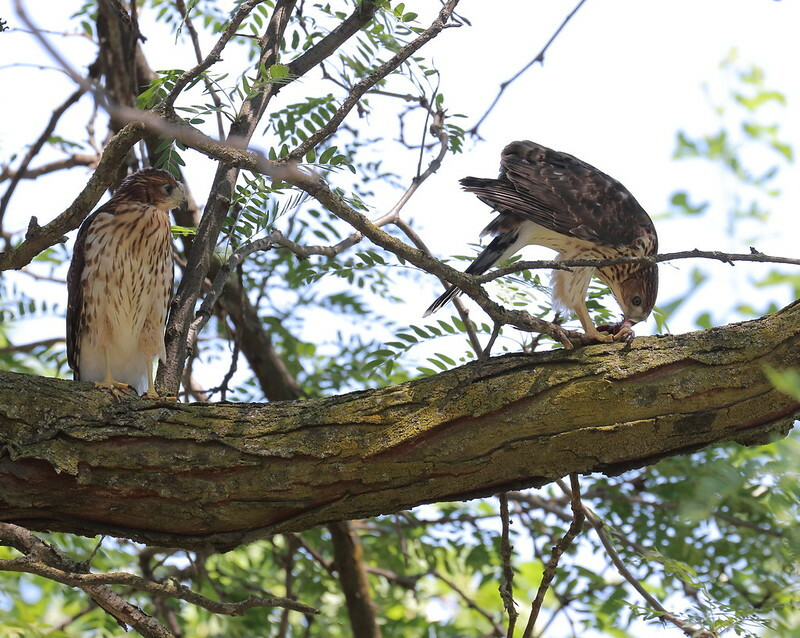 This looked to be because of an adult which arrived with more food and landed in the nest tree, which drew the fledgling on the left to the new food. When the other fledgling returned to the same branch with its food, the other grabbed at it, and both pieces of food dropped to the floor. It looked like one grabbed one food item off the ground and made a quite steady flight a short distance away, while the other didn't seem to clue in where the food was and continued to look for it on the ground. July 10 - some more shots I was able to get of the adult male with one of the fledglings, providing food on the same branch nearby to the nest tree. The fledgling did come and get the food but was not highly aggressive about taking the food. 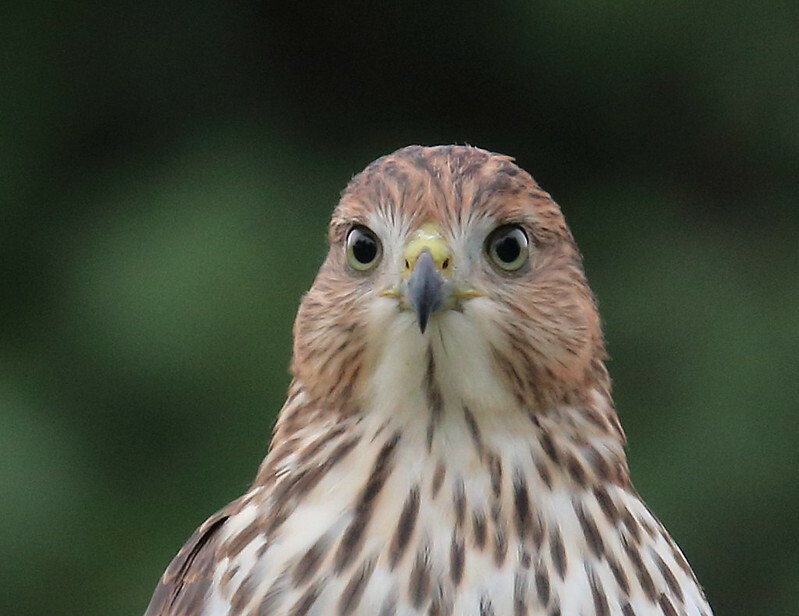 This shot shows an identifying characteristic of the adult male which matches the 2017 season, the left eye has an irregular black blotchy mark on the iris. 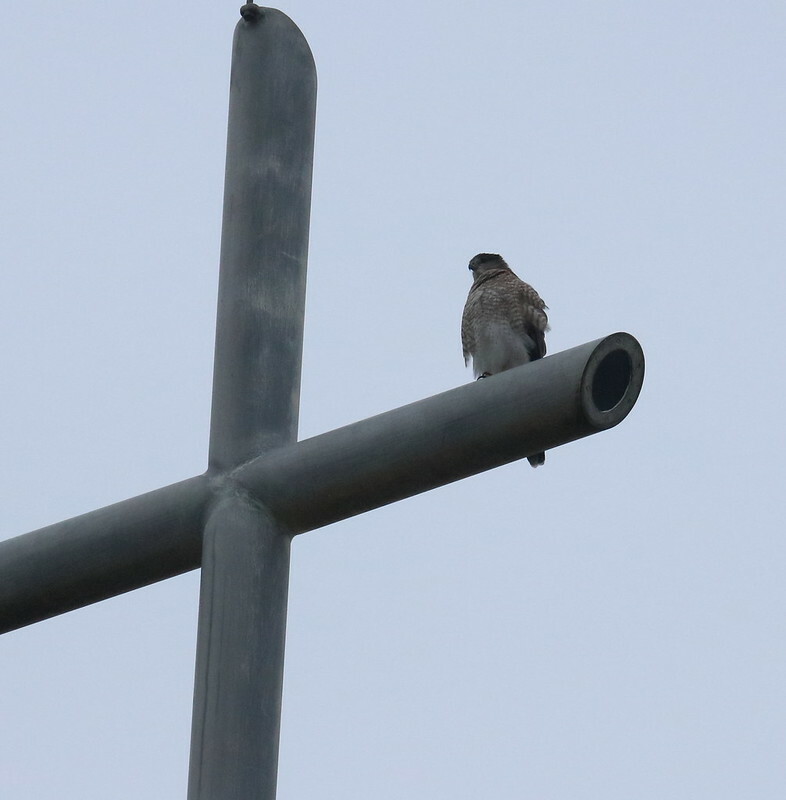 July 11 - I took a shot of the adult male on this antenna across the street from the park, as one thing I've also noticed about the current pair's behavior which is a bit different, is their greater tendency to roost on manmade structures. 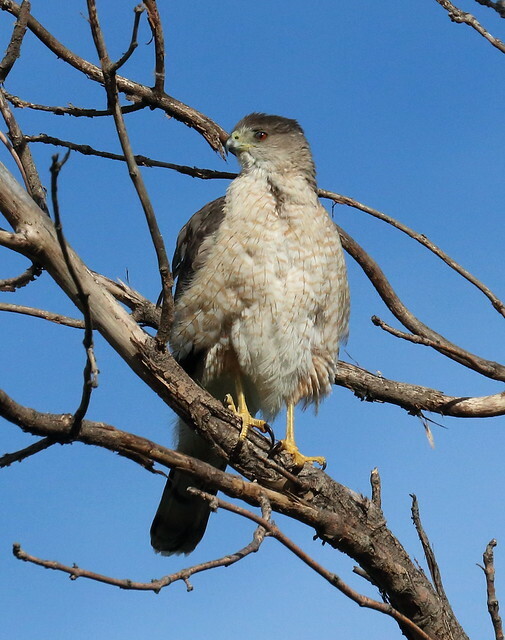 In the past they have occasionally done so, but it has been pretty uncommon compared to roosting on trees, even when there are artificial perches that would provide significantly higher, more open vantage points. July 20 - most recently I am sometimes not hearing or spotting fledglings when I go out into the park, although they are presumably present. Actual sightings are less frequent than when they were consistently very close to the nest tree. On a number of occasions I do hear whistling NE of the nest tree, in the area where it can be hard to spot them. This is one of the few recent shots I've been able to get. July 27 - early evening I was not able to find either fledgling on a quick walk through of the park, but then after sitting for about 15min I suddenly started hearing loud whistling calls from the small stand of trees and bushes a bit further E of the nest area. 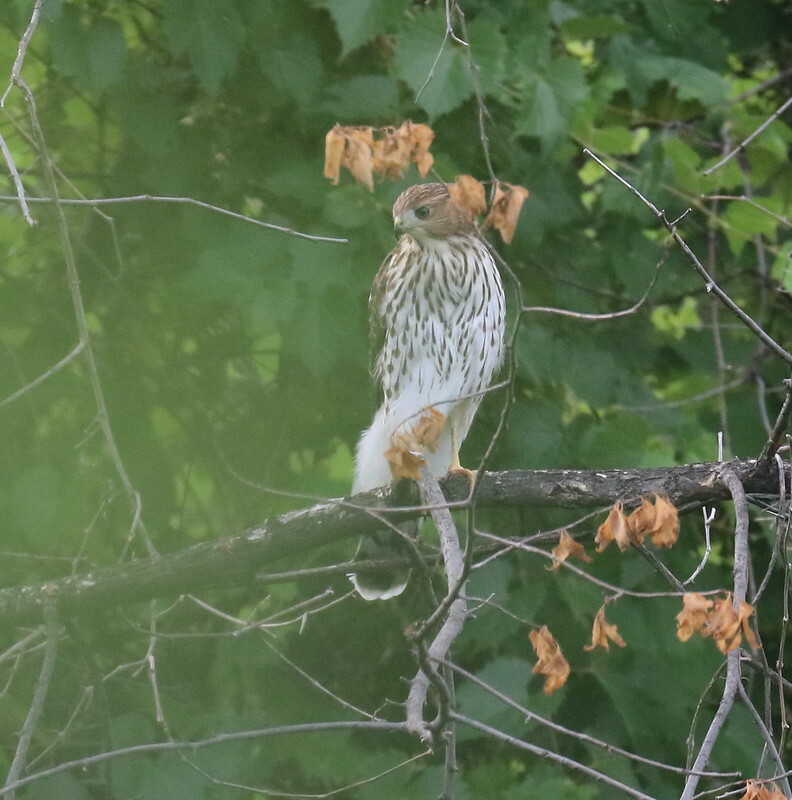 At least one bird came flying out from the stand, which seemed like the adult male leaving, and I found one fledgling on the other side up on an open branch towards the upper part of the trees. It looked to have some pretty deplumed prey. After a few minutes I spotted the other fledgling also present, but in a lower down branch and further in under the leaf canopy, it was difficult to take shots because of the very low light in there. But it also had prey, interestingly definitely not fully deplumed. It seemed most likely to be robin, and I suspect probably both prey items were. I'm not finding the fledglings in the area right adjacent to the nest anymore at all, and I haven't seen the female in her roosting spot in quite a while now - presumably she has joined the male in hunting outside of the park most of the time now. July 28 - I once again found one of the fledglings in the trees about halfway between the nest and the east end of the park. 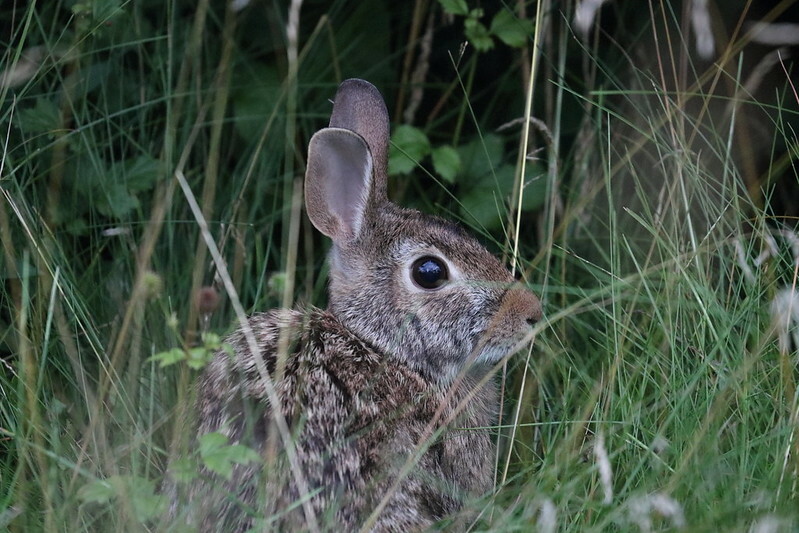 While I was observing the fledgling roosting in the branches of the tree, and I was walking slowly through the thick grasses around the stand of trees, I spooked this cottontail bunny which was sitting down in the grasses. I wonder if it was keeping still particularly because of the Coopers, although I haven't seen them chase rabbits much. July 29 - early in the evening I found one of the fledglings in the large oak tree which is just inside the east border of the park near the N corner. This has been a tree regularly used by fledglings in previous years. 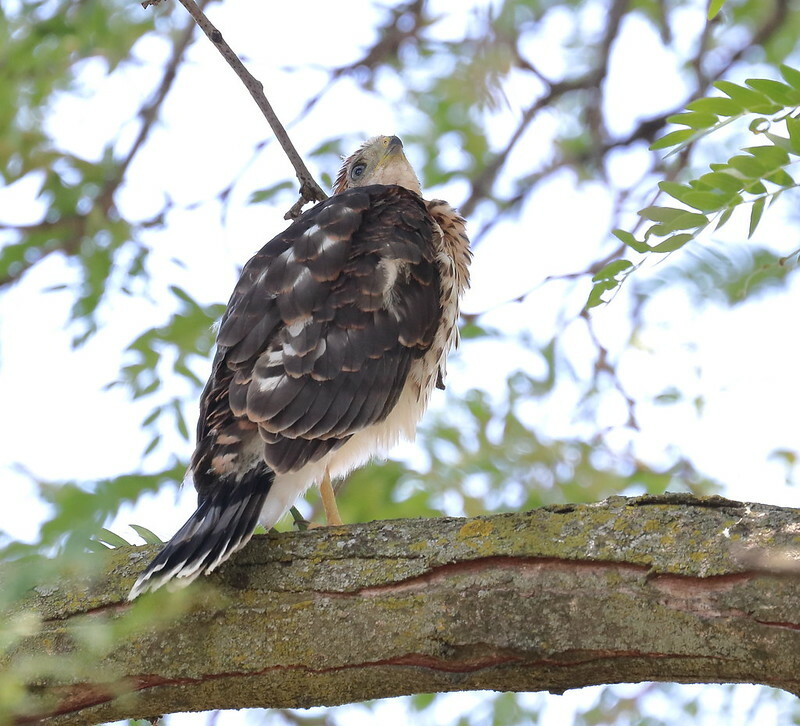 The second fledgling came from somewhere nearby into the oak tree, and both of them became pretty active, moving around quite a bit after each other, but I don't think there was any food. After some period of time they ended up flying over to one of the pine trees along the N border nearby, and were both there for about 10 minutes. This was the first time I observed them fly outside the boundaries of the park, if only slightly into trees along the adjacent street close by - both started vocalizing quite a bit and looking out to the N, and then both flew directly out in that direction, I'm sure this was due to them spotting an adult with food. 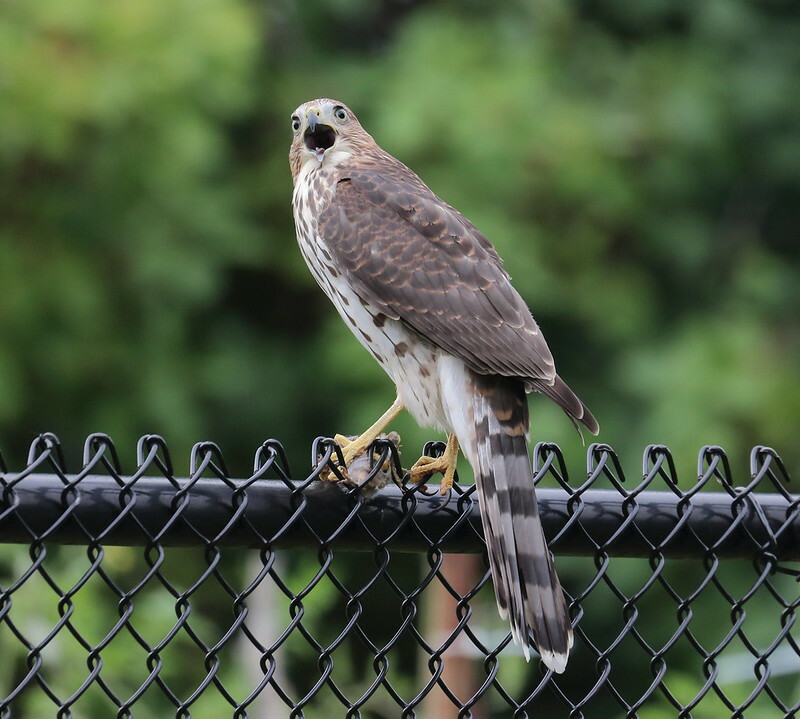 I left the park and came back about 20min later, and there was one fledgling along the fence line right in the NE corner eating something, so this may have been the food they were going after. July 29 - roosting in the oak tree. Starting to call for food. 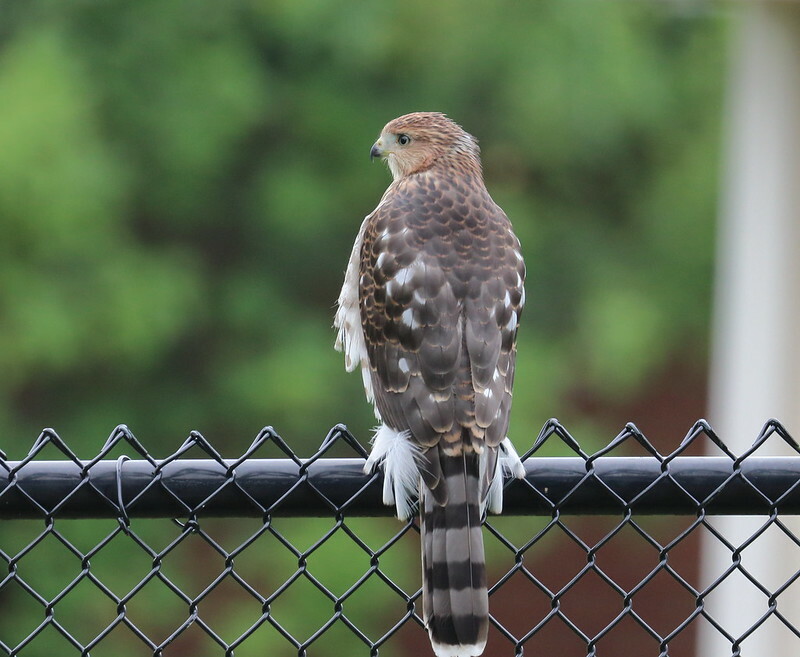 July 31 - I found both fledglings on the fence line in the NE corner, they spent quite a bit of time on the fence, and occasionally moving to the trees in the immediately adjacent backyard. 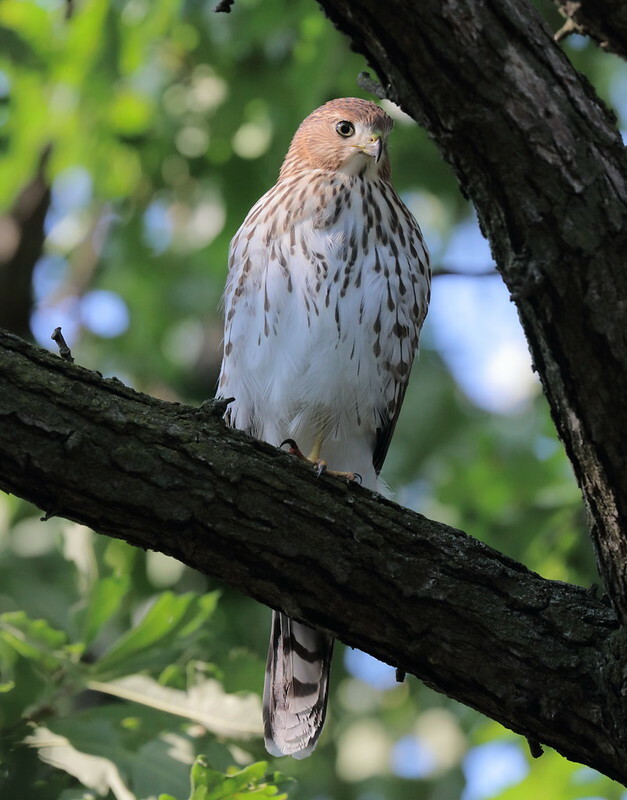 Aug 2 - a brief check to the park around noon yielded a lot of sudden whistling from both fledglings that looked to fly up into the large oak tree near the NE edge of the park, possibly due to a food delivery, but upon walking to the area neither hawklet was present in the tree. 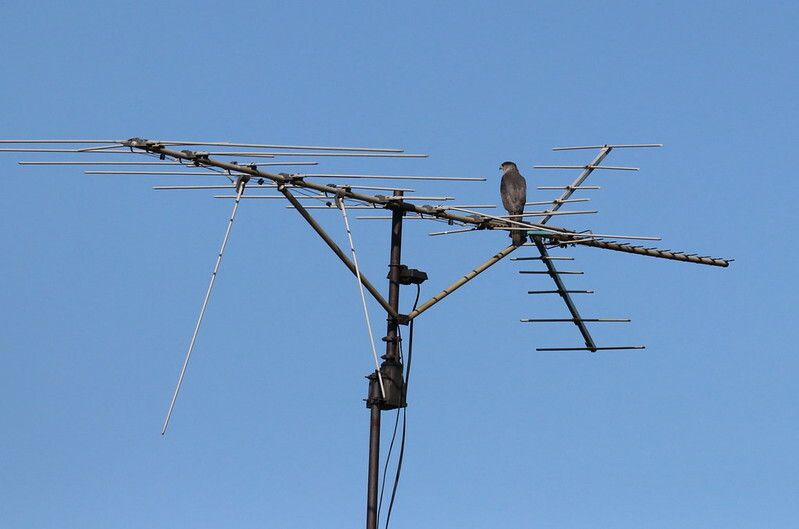 One seemed to have likely left the park to the east side, and the other had alit on top of a tall backyard antenna along the east side. After a few seconds the other also flew out in a straight beeline out of the park towards the east, perhaps following a sibling with food. This was another clear indicator of the fledglings leaving the park boundary at least some of the time. 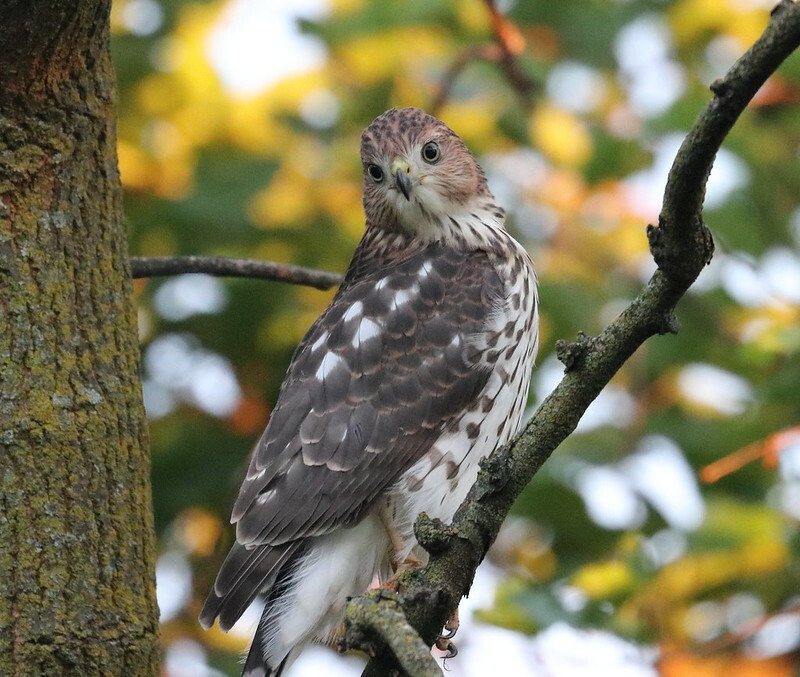 Aug 3 - early evening has been a good consistent time to find fledglings, particularly either in the area in the NE corner, where the large oak trees and the conifers along the N edge are, or in the shorter stand of trees in the center W of the path. The latter also seems to be quite a frequent spot now for fledglings to receive and consume food deliveries from the adults when they happen. Looking up at passing ring-billed gulls. Some footage of the fledgling roosting, with some alarm calls from nearby American goldfinches and downy woodpecker. After some time there was a food delivery to the tree which the fledgling consumed. Aug 5 - the same tree in early evening yielded both fledglings, making quite a bit of whistling vocalizations although no food was evident. 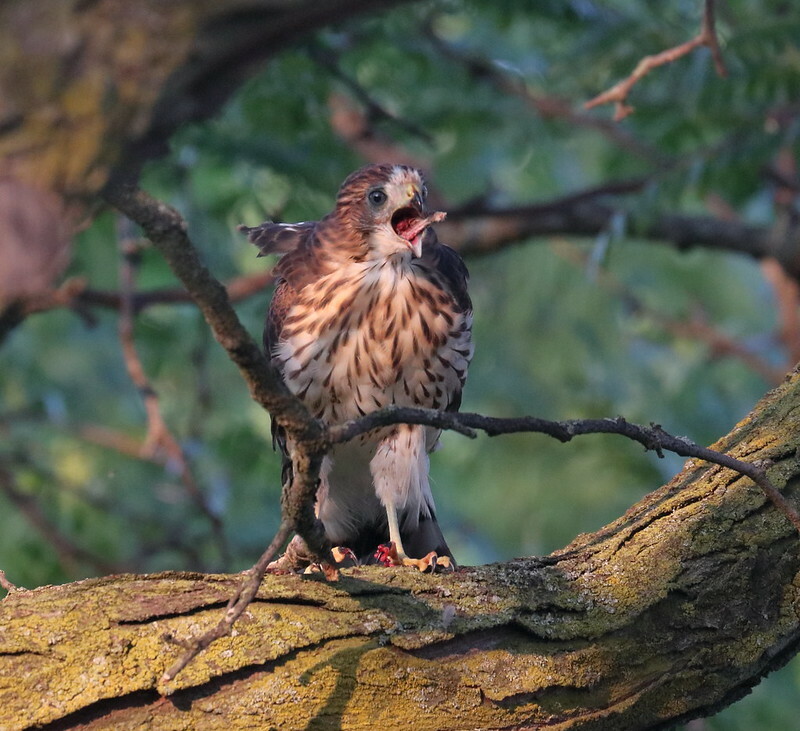 Aug 10 - going out to the park in late afternoon I once again found one of the fledglings vocalizing in the central stand of trees, after about 10 minutes it got quite excited with vocalizations almost as if reacting to an adult, but without any apparent arrival or exchange by an adult. Shortly after I was fortunate to be able to observe the fledgling go into flight and start some extended soaring over the park and eventually outside the N border. 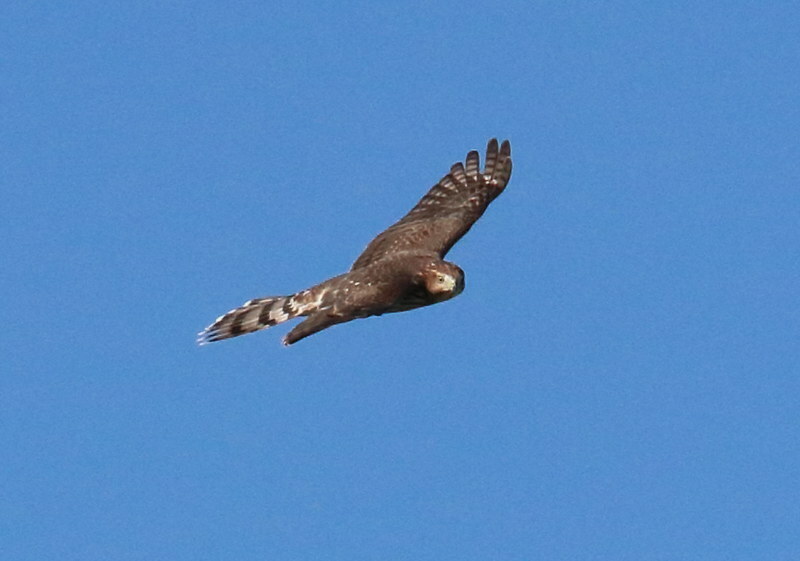 After a number of minutes of soaring it drifted far enough in the N direction and also gained a fair amount of altitude, I lost sight of it, but another definite case of obviously ranging outside the park border. About 30min later one of the fledglings was back, and received a food delivery from an adult, as seems typical for early evening. This prey seems most likely to be undeplumed robin, and is suggesting the adults have reverted to delivery unprocessed prey for the fledglings to deal with. 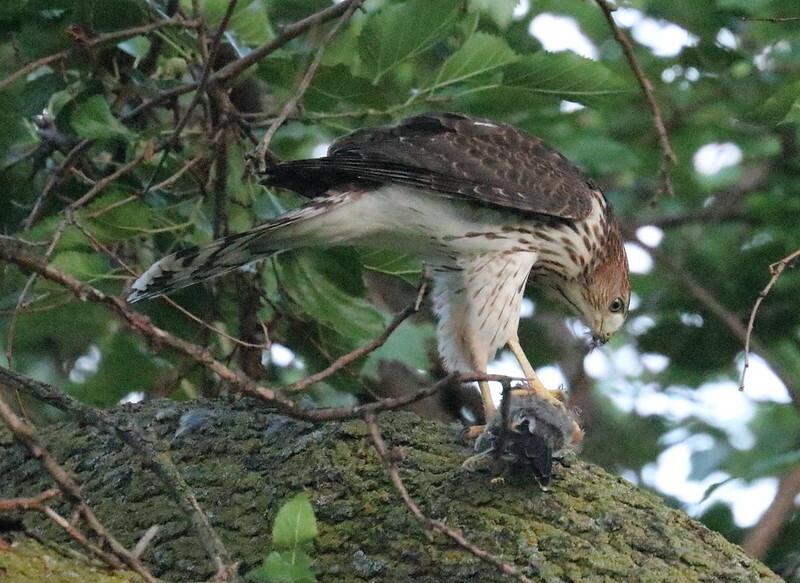 It took close to 25min for the fledgling to finish consuming this bird. 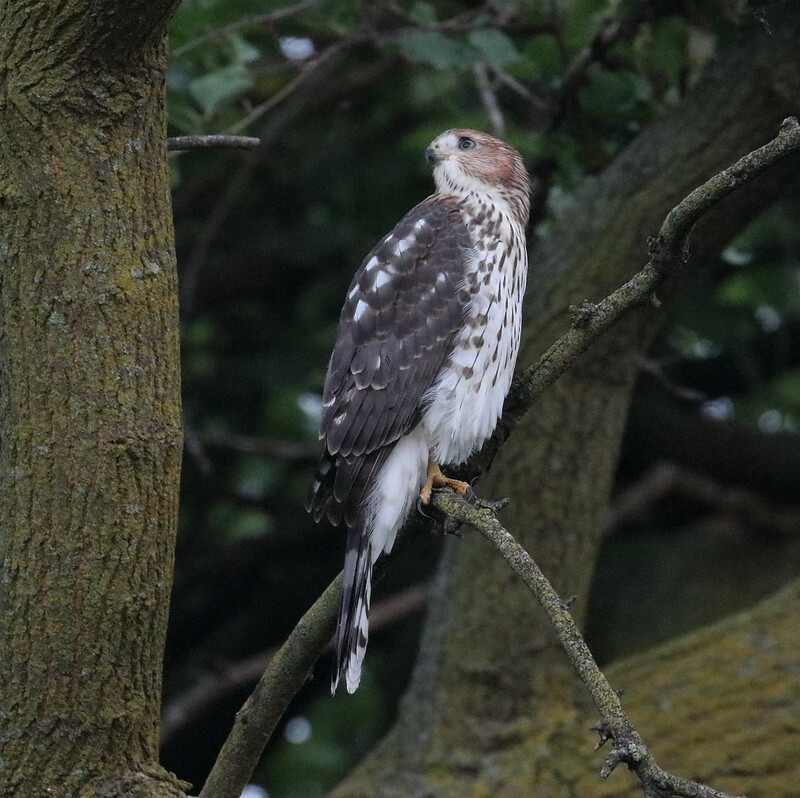 Oct 6 - I found this adult in the park in the morning, I had not seen a Coopers in a number of weeks since the dispersal of the fledglings in mid-August, except for a couple of brief sightings E of the park in flight which I could not get a good look at to confirm adult or juvenile. 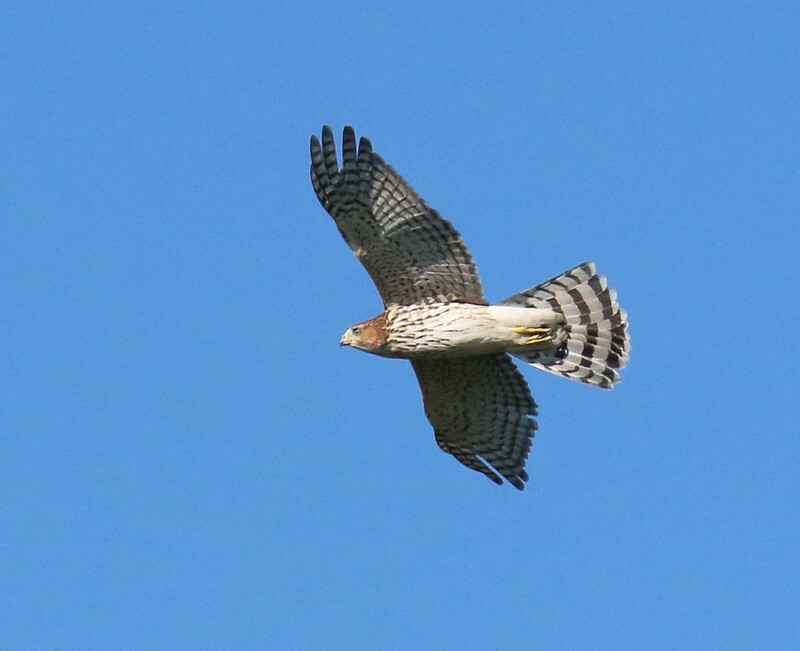 I had seen a Coopers up on the church N of the park the previous day, and probably this was the same individual. The resident male has a distinctive unusual shape to the dark iris on his left eye, I'd noted this from photographs earlier in the season. I tried to brighten this up to attempt to see if this could be the local male but it's difficult to tell definitively since the lighting conditions were very dull and it was shot with high ISO. Not long after I found him back up on the church N of the park. 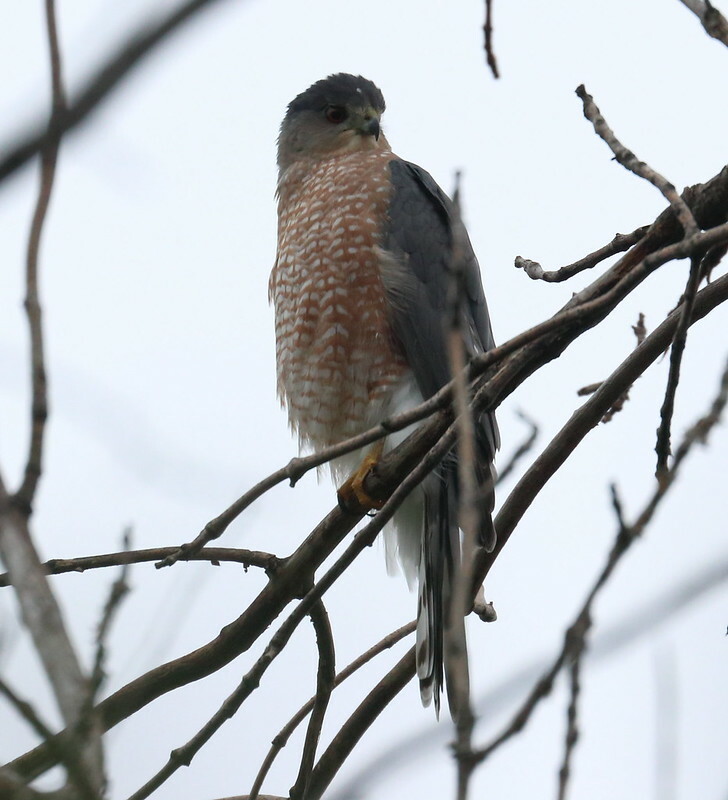 Dec 01 - It's been quite some time since I've had a Coopers sighting in the neighbourhood, but this morning I spotted a full adult roosting in a tree at the end of a cul de sac which is just a half block N of the park. I have seen some houses along that street with hanging feeders in the past, so it may have been keeping an eye on the feeders.